From now on, people with a physical disability will be able to view the exhibitions in the Van Abbemuseum in Eindhoven. 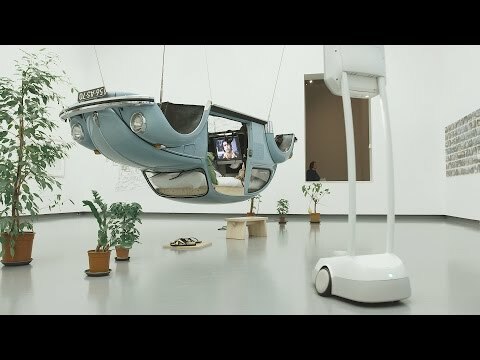 A telepresence robot makes it possible to experience the museum and art from their own environment. People can book the robot via the Van Abbemuseum website. After downloading a program, a time is allocated in consultation for their museum visit. People can book the robot via the Van Abbemuseum website. After downloading a program, a time is allocated in consultation for their museum visit. The control is simple and can be adapted to the needs of the visitor. The tour leader can help and discuss the works of art with them. The telepresence robot, which comes from America at a cost of 20,000 euros. The application can be extended to hospitals, care homes and rehabilitation centres. School classes can also log into their classrooms via their IWB and take a guided tour of the museum. The Van Abbemuseum is the first museum in Europe to make a museum visit structurally possible in this way. This makes the museum accessible to everyone, regardless of their physical disability. "The museum of the future is now quite close," says Charles Esche, director of the Van Abbemuseum. "This project connects art with technology, something that fits perfectly with the Eindhoven region. But above all it is beneficial for the visitor, who can get acquainted with our works of art, regardless of his location. That's the hospitality we strive for.